One of the most notable features of the Madagascar and Indian Ocean Islands Hotspot is the extremely high floral and faunal endemism. Endemism in the hotspot is marked not only at species level, but also at higher taxonomic levels. The global importance of the hotspot is particularly high for mammals, plants and reptiles. Madagascar is known for its rich native flora, with around 90 percent of vascular plants found only on the island. Over 11,200 species of vascular plants are currently known to occur on Madagascar and it is estimated that at least 2,500 species remain to be discovered or to be described. Though there is low diversity among the birds found on Madagascar and the surrounding islands, there is spectacular specific endemism. Of the 503 species found in the hotspot, nearly 60 percent are found nowhere else. The birds in the region are seriously threatened: more than 55 endemic species are Endangered, and 32 have already disappeared, mainly in the Mascarene Islands. In Seychelles, the extinction of three endemic species is documented in the 20th century, but it is likely that the actual list is longer. The hotspot was also home to the famous dodo, (Raphus cucullatus) eradicated only a few years after the first settlers arrived in Mauritius. Similar to birds, terrestrial mammal diversity in the hotspot is relatively low, but the level of species endemism is exceptional. Of the 211 native species of land mammals, 95 percent are endemic. New species are being discovered in Madagascar at a rapid rate, especially lemurs and small mammals: in the past 15 years, 22 new species and subspecies have been described. Madagascar's most fascinating mammals are arguably its lemurs, found only here. The lemurs themselves are very diverse: from the Endangered Berthe's mouse lemur (Microcebus berthae), which weighs just 30 grams, to the Endangered aye-aye (Daubentonia madagascariensis), which has huge ears and steadily growing incisors. The hotspot is also a diversity center for bats, which were the only mammals naturally present in the Mascarene Islands and the Seychelles. Of the 50 bat species found in the hotspot, 78 percent are not found anywhere else in the world. Comoros is home to, among others, the largest species of bat in the hotspot, the Critically Endangered Livingstone flying fox (Pteropus livingstonii), whose wingspan may reach 1 meter. Seychelles hosts the world's rarest bat, Coleura seychellensis, whose global population is fewer than 100 individuals. The region is home to 457 species of reptiles, of which 96 percent are endemic. Some groups have already experienced a high extinction rate, including the giant tortoise, of which only the Aldabra tortoise (Aldabrachelys gigantea), listed as Vulnerable on the IUCN Red List for Endangered Species, remains. 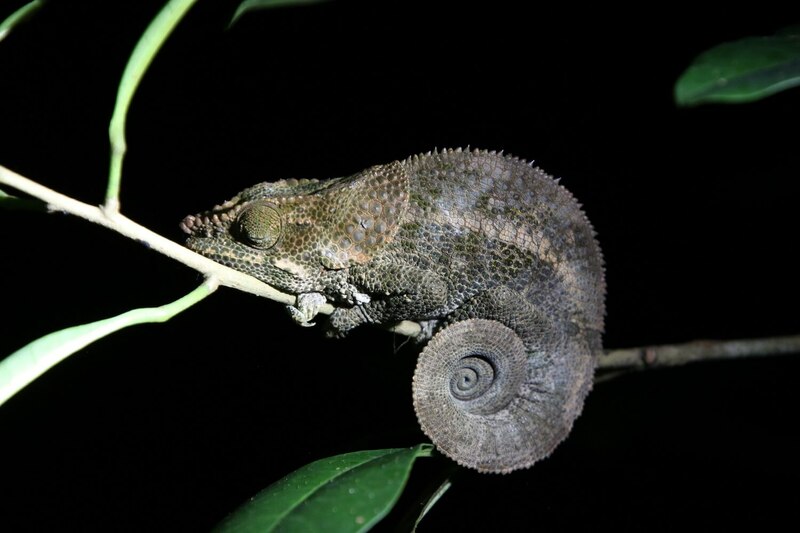 The region is a major center of diversity for chameleons, with dozens of species in Madagascar and one or two neighboring islands. Two families of amphibians are endemic to the hotspot: the Sooglossidae found in Seychelles, and the Mantellidae, tree frogs whose skin contains toxic alkaloids, present in Madagascar and Mayotte. The specific amphibian endemism in the region is extraordinary, with only one species out of the 309 identified not endemic to the hotspot. The invertebrates in the region are not yet fully known. In Madagascar, the total wealth of known terrestrial is about 5,800 species (and 2,500 pending description), and 86 percent are endemic to the island. The western Indian Ocean is home to 108 species of sharks, including 11 that are endemic, and 66 species of skates. The Indian Ocean is home to 2,086 species of fish that have to live in coral reefs. One of the most remarkable species of fish in the region is the Critically Endangered coelacanth (Latimeria chalumnae) whose morphology has changed very little over the past 350 million years, earning it the nickname "living fossil." The species is present in deep areas of the ocean, particularly in the Comoros archipelago. The southwestern Indian Ocean is an important breeding and feeding area for five of the seven species of the world‘s marine turtles—the Endangered green turtle (Chelonia mydas), Critically Endangered hawksbill (Eretmochelys imbricata), olive ridley (Lepidochelys olivacea), loggerhead (Caretta caretta) and leatherback (Dermochelys coriacea). Particularly important nesting sites exist in the Comoros, Seychelles and Iles Eparses. Read more about the hotspot's species in chapter three of our ecosystem profile (PDF - 7.1 MB), also available in French (PDF - 7.5 MB).